The issue of how the mind works probably remains wrapped in relative obscurity, so far as the concern of the average person goes. By "average", reference is being made to the person who is unaware that the Mind is indeed the supreme factor which governs - literally - everything which constitute his or her life, world and affairs. Naturally, this is not the case to anyone who, so-to-say, has awakened to that which the philosophy of mind can impart. Accordingly, just as in the preceding section, an idea of what the human mind is was put before the inquirer, here it shall be endeavoured to present a conception of the process or processes by and through which the Mind performs its various functions. It may be interjected again, as first mentioned in the previous discussion on the Human Mind, that, based primarily on philosophical argument (but physical substantiation also exists), the Mind and the Brain are not one and the same. As previously stated, metaphysics generally suggests that the Brain, together with the physical body, is the instrument through which the Mind interacts and corresponds with the individual's external environment. Therefore, little (if any) reference shall be presented here regarding any investigation into the physical phenomena often associated with the activities of the Brain or the physical body. What is desired here is to highlight the principles which may be said to exist at the heart of how the mind works, coupled with the view to pointing the way towards their practical application. "Mind is the Master-Power that molds and makes. The first line of that verse aptly defines and describes Spirit or Universal Mind as that Original Creative Power, by and through which everything that constitutes the physical universe came into being. In like manner, the first part of the second line ("Man is Mind,...") is reflected in the above diagram. The proposition that "... evermore he takes the Tools of Thought, etc." concisely reflects the hypothesis that Thinking has been determined to be a perpetual process, which can never be suspended or shut-off, i.e., via his thought or mental action, Man is always - either consciously or unconsciously - setting some sequence of causation in motion, relative to his or her individual world. And the last portion of that verse ("... thinks in secret, and it comes to pass, etc.") succinctly expresses that which may be found in both religion and philosophy - namely that, as the Bible expresses it: "as he thinketh in his heart, so is he." From this point, we shall explore the working of "the Tools of Thought", with regard to how the mind works. Just in case it has not already been done, the phrase previously mentioned: "as he thinketh in his heart, etc. ", shall be expanded upon, so that its true meaning will be properly grasped and comprehended. The "heart" mentioned here is not a reference to the physical organ which circulates the blood through the body, but rather, it is a symbolic representation of the Subconscious Mind. Going further, the thoughts or ideas which reside in the Subconscious Mind - whether consciously or unconsciously - constitute the individual's Beliefs. This is why, at the end of the discussion on the Human Mind, it was mentioned that one authority on the subject expressed that: "for each one of us, our beliefs constitute our realities". 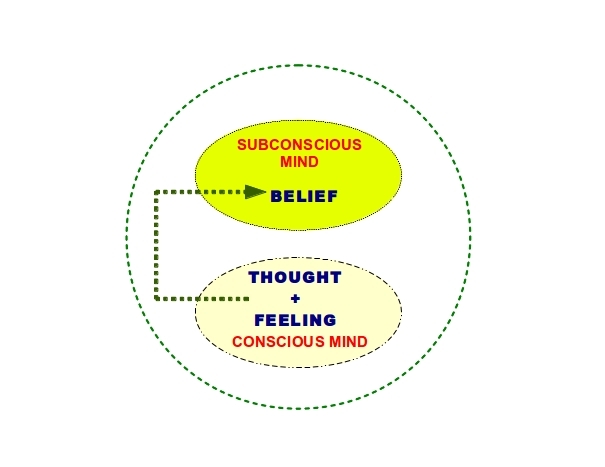 In more specific terms, a Belief constitutes a Thought or Idea, first formed in the Conscious Mind, and then "imbued" with Feeling or Emotion, and as a result of being so imbued, is impressed upon the Subconscious Mind. This definition is of very significant importance, as it has been determined that Thoughts which are not imbued with Feeling (i.e., purely Intellectual Thought), do not become Beliefs. It also serves to explain why in many instances, persons who do not grasp the importance of Feeling or Emotion, and its connection to how the mind works, find themselves unable to consciously and deliberately apply said power in their own experiences - more often than not, they are operating with purely Intellectual Thought, where they should be imbuing their Thought with Feeling. As another brief interjection, there are some schools of reasoning that teach that, if a particular Thought or Idea is repeatedly contemplated or dwelt upon by an individual, it will inevitably establish itself as a Belief, and there is indeed an element of truth in such a teaching. But it is here volunteered that the process of establishing a Belief is accomplished (relatively speaking) much faster and more efficiently, if the individual recognizes the important position that emotion or feeling holds in the matter of how the mind works, and practically applies it. This may also serve to explain why advice is given in the New Testament of the Bible, not to use "vain repetitions" when engaged in the act of prayer (Gospel according to Matthew, chapter 6, verse 7). 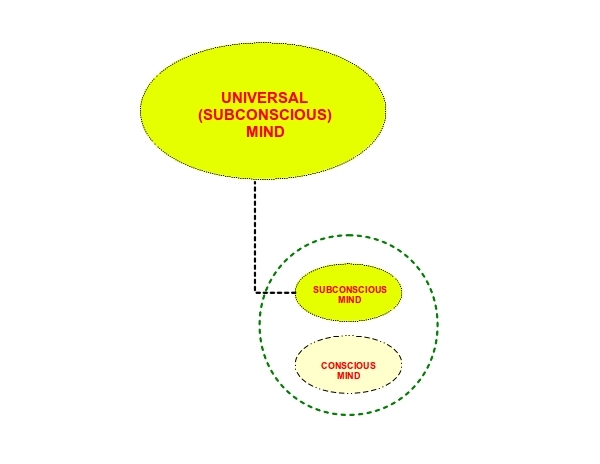 As already mentioned, the Individual Subconscious Mind is perpetually unified with the Universal Mind. 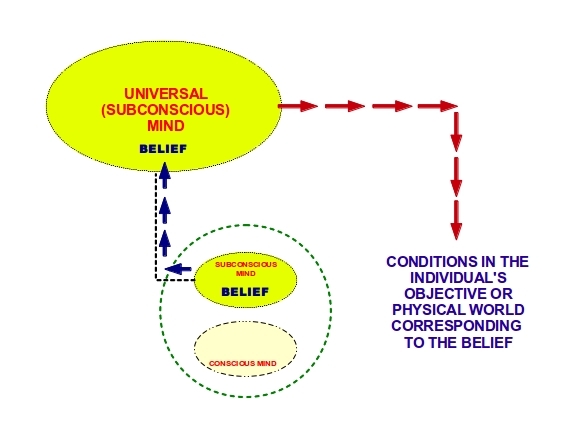 Consequently, any Belief established by an individual is, so-to-say, simultaneously established in the Universal Mind, thus setting in motion a Creative Process, which, if left to run its course, will inevitably result in the establishment of conditions in the individual's personal world, which correspond (or match exactly) with the quality of their Belief. The state of emotion or feeling may also be referred to, in more technical language, as a state of consciousness. In addition, any comprehension of how the mind works will reveal that, because a state of consciousness is a mental activity, then any particular state of consciousness can be cultivated in the mind of an individual and maintained therein, through the individual's exercise of the faculty called Will, which shall be covered in more detail, on another occasion. Now, based upon the established dictum, regarding the parallelism between the Macrocosm (the overall universe) and the Microcosm, which was first mentioned in the discussion on Thought Power, it was deduced that the mental activity exercised by Universal Mind or Spirit, which inevitably led to the creation of the universe, could only have been the formation of a particular state of consciousness. Thus, the Creative Order, i.e., the modus operandi by and through which "thoughts become things", is that the state of consciousness (i.e., thought imbued with feeling) constitutes the Cause, and the corresponding conditions which come into being in the physical world constitute the Effect. And, from our previous discussions, some of which revealed and emphasized the proposition that the Individual Mind is a reproduction of the Universal Mind, differing only in scale, then the Creative Order, as defined above, applies equally to the Individual Mind, as it does to the Universal Mind. 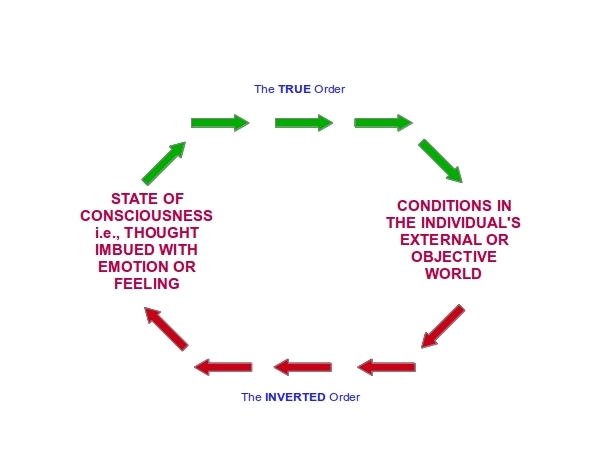 As can be seen, the above diagram illustrates that which was mentioned in the preceding paragraphs - namely that, the Creative Order is: from state of consciousness to external conditions. It also indicates (indirectly) the way in which the majority of people operate - namely, from external conditions to a state of consciousness, i.e., they invert the Creative Order. Expressed in more simpler terms, they operate on the premise that, if they should first realize some particular condition or set of conditions, they would subsequently realize and experience a particular combined mental and emotional state. Just as a simple example, the viewer has doubtless heard from another person - or they may have expressed a similar idea themself - that, if or when they achieve a particular thing - a new car, a dream home, a certain sum of money, etc. - then they would experience happiness, contentment, peace of mind, etc. In this example, the particular thing desired represents the condition, and the feeling or emotion expected to be experienced upon its attainment is the state of consciousness. However, because they have - either consciously or unconsciously - inverted the Creative Order, they are actually working in opposition to the true way, regarding how the mind works, and consequently, the state of consciousness they form and maintain is not that which, according to the Creative Order, will inevitably lead to the formation of the desired conditions. To make a long story short, their chances of ever realizing the object of their desire are therefore greatly diminished. Accordingly, those authorities who realized the true working of the Creative Order, ever sought to impress this truth upon their respective audiences - each in his or her own particular manner, and it is here recommended that the person who may be encountering the subject of how the mind works should "go therefore and do likewise". And, as a final note, the particular phrase from the verse by James Allen's verse, which reads: "... shaping what he wills,..." actually contains a significant point that anyone who seeks to understand how the mind works, and to practically apply that knowledge, would do well to grasp - a point that was first highlighted in the discussion on the Bible Promises, but one that is well worth re-iterating. Simply stated, it contains the truth that Man (i.e., the Individual Mind), is NOT the Original Creative Power per se, but rather, from the metaphysical standpoint, Man can aptly be defined as the "Specializer" of the Original Creative Power. Expanding the point further, and as was first mentioned in the discussion on Universal Mind, metaphysical reasoning has deduced that the Original Creative Power (a.k.a. Universal Mind or Spirit) operates by what might be considered certain generic principles, i.e., principles which are spontaneously provided by Nature, and which apply equally to all members of a particular genus, or class. It has been further deduced that these principles contain (literally) infinite possibilities and potentialities, but these cannot be realized by the merely generic operation of Universal Mind. It is here that the Individual Mind comes into play, as a centre of creation, capable of exercising certain powers and faculties - some of which will be addressed in more detail in another section - which thereby lead to the specialization of the Original Power, i.e., the creation of specific conditions in the individual person's world, which are not spontaneously provided by Nature, and thereby enabling the Original Power to work in the individual person's world, in previously unexpected ways. In addition, by virtue of his or her position as the "Specializer" of the Original Power, the Individual effectively directs the Original Power what to ultimately bring into being in their personal world, without dictating how the process of creation is to operate. This often is a stumbling-block to the newcomer to the subject of how the mind works, as they very often operate with the belief that they have to consciously and deliberately direct and control every step of the operation. As mentioned in the discussion on Anima Mundi, this modus operandi is that of Construction, whereas Universal mind operates via Creation - a totally opposite process. Fortunately, the person who persists in gaining the requisite understanding will come to the realization that, once their mental faculties are properly employed to give direction to the Universal Mind, then the required conditions corresponding to their desired object must and will come into being. This, from the standpoint of general metaphysics, is Man's place in the order of the universe - to advance evolution (i.e., the progression from lower to higher degrees of manifestation) beyond the point which has been reached to date, through the merely generic working of Universal Mind, and the primary means by which this shall be accomplished is a clear understanding of how the mind works. Full Online text of "How The Mind Works" by Christian D.